Low-income students around the country are enrolling in colleges at increasing rates, and 39 percent of undergraduates were at or below 130 percent of the 2016 federal poverty line, according to the National Postsecondary Student Aid Study. Universities in Kentucky and Southern Indiana have opened on-campus food pantries and begun food rescue programs in attempts to meet students’ basic needs. 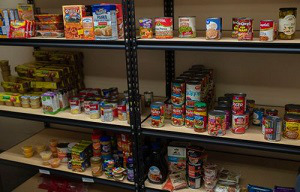 Students at the University of Louisville recently opened a food pantry on the campus, adding to the list of similar programs at local colleges like Bellarmine University, Spalding University and IU-Southeast. Over 640 colleges and universities around the country operate food pantries on campus, according to data from the College and University Food Bank Alliance. Rebecca Broda, a student at Bellarmine University, said she got the idea to open a food pantry her freshman year after attending an alternative spring break program in Charleston, South Carolina. Broda and a committee of fellow students organized a partnership with Dare to Care Food Bank last year to stock a food pantry in an administrative wing of the Centro campus center, according to the Courier Journal. Since the pantry’s opening in November, the Bellarmine pantry has served 120 individuals, said Natasha Begin, assistant dean of students and a supervisor of the program. Begin noted that Bellarmine and other institutions across the country have more work to do to support low-income students. “If we want to see them succeed, we need to put more support in place to help them do that,” she said.